Today I’m attempting to explain “life’s work” in a way that will set you free – if you’ve ever struggled with knowing exactly what your life’s work or purpose really is. This episode is going to be a big sip. So big that you may need to chew on it a bit. This topic of “life’s work” has been one that I’ve wrestled with at some level throughout my life. Even though I felt as though I knew what my “calling” was from the time I was very young. Our life’s work is not what we do, but who we’re being and becoming while we’re doing what we’re doing. Your life’s work is who you are! When you’re fully engaged with who you are, your life WILL work. When I began the process of discovering my life’s work, I entered into the art of healing. At times the process was painful. But it led me into my own miraculous healing. I discovered that a healer isn’t someone who heals another, but one who has healed or is healing. When we begin to receive our own healing, we can enter into a life that works, and our true life’s work. My life wanted me to know my “life’s work” as badly as I wanted to know it. So much so that my life began telling me the story. It wasn’t until I became conscious enough to actually hear the story, recognize it, and receive the truth about it that I entered into my life’s work. I’ll never forget the day that I became absolutely certain that I was (am) a messenger of hope. Little did I know that this process would take me through some very hopeless terrain that felt very hopeless at times. I had to uncover, and discover truth that restored the foundation of my TRUTH, center, and core…bringing me back to MY HEART. After three divorces, I finally acknowledged that I was the common denominator. I had to ask myself what was really going on within me, and dive deeply into my heart for the answers. I’ve lived from this very hopeful place ever since. It’s led me to the discovery of my sacred life’s work. When you awaken the hope that’s within you, and become conscious of it, you discover your beliefs, desires, TRUTH…and you can trust it. Life wants you to know as badly as you want to know. Are you willing to be quiet enough to actually pay attention and listen to your heart? Pay attention to what LIFE’S telling you. Your life’s work is YOU…and within you. When you go within, you will no longer go without. You’ll tap into a power that’s profoundly you, and begin to share from that place. Typically with our life’s work, there’s a PROBLEM. There’s also PAIN involved. The problem is that most people will attempt to avoid pain, instead of going into it and exploring what the pain is trying to tell them. When I began to acknowledge and embrace the pain I was able to get answers to some lifelong questions that I had. Truth got me to live my life’s work. It’ll get you to live yours too. Beyond the pain is an incredible solution to a problem. Your life’s work is connected to a massive SOLUTION. YOU are the carrier of the message of this solution. When you realize that YOU are the carrier of the SOLUTION that’ll get your life working, you’ll enter into your LIFE’S WORK. Go all into the refining fire of your life’s work. Write down your story up until this point in your life. Stop running from your own story. What’s your story telling you? Stop being a STORY TELLER, and take time to actually listen to, and figure out, what your story’s telling you. 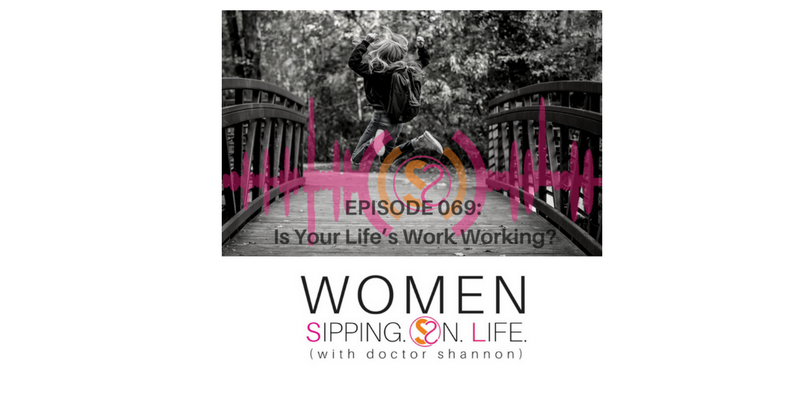 Is your life working and is your life’s work working? When you begin to work…YOUR life’s work…your life will work. What do YOU think? I’d love to hear from you. Do you have any questions or comments? Please let me know what you think.